As expected, Clemson and Alabama pulled through with playoff clinching championship wins this past weekend, and Michigan State Spartans took down the Iowa Hawkeyes after quarterback Connor Cook marched his team on a 22-play, game-winning drive late in the 4th-quarter. Big 12 Champion Oklahoma held on to their playoff spot after having the weekend off (the Big 12 does not have a championship game). The Peach Bowl and Fiesta Bowl followed suit with my projections. The Peach Bowl selected Florida State and Houston to play in Atlanta, Georgia on New Year’s Eve, and the Fiesta Bowl went with Notre Dame and Ohio State to play in Glendale, Arizona on New Year’s day. After a loss to Michigan State in the Big Ten Championship game, Iowa secured a spot in the Rose Bowl against Stanford. Oklahoma State earned their spot in the Sugar Bowl against Ole Miss after the Baylor loss to Texas. Both the Rose Bowl and the Sugar Bowl take place on New Year’s day; the Rose Bowl is in Pasadena, California and the Sugar Bowl is in New Orleans, Louisiana. 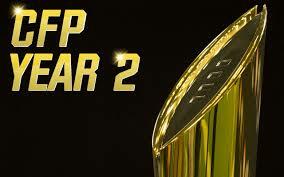 The Playoff games will take place on New Year’s Eve in Dallas, Texas (Cotton Bowl) and in Miami Gardens, Florida (Orange Bowl). All throughout December and the first half of January you can catch an abundance of bowl games consisting of teams all around country with at least six wins (with the exception of a couple of teams who only have five wins). 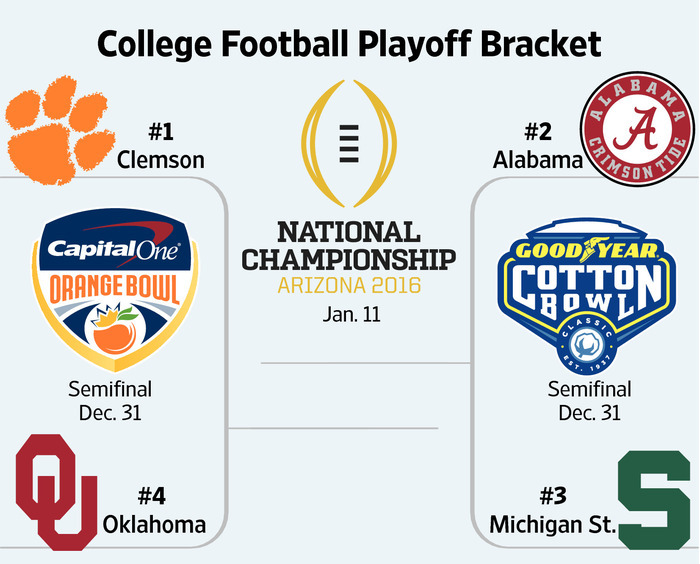 The conclusion of bowl season will be on January 11, 2016 in Glendale, Arizona for the College Football Playoff National Championship game. Russell Athletic Bowl (North Carolina v Baylor), AdvoCare V100 Texas Bowl (LSU v Texas Tech), Franklin American Mortgage Music Bowl (Texas A&M v Louisville), and Valero Alamo Bowl (Oregon v TCU). ← What do you do when you see a spaceman? Park in it, man.